Getting kids helping in the kitchen has always been a passion of mine. 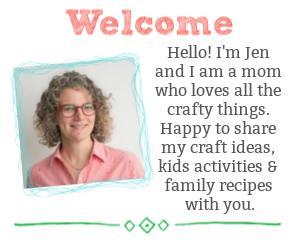 Over the years I’ve shared all the ways that we like to include our kids in gardening, meal planning, food preparations and more. 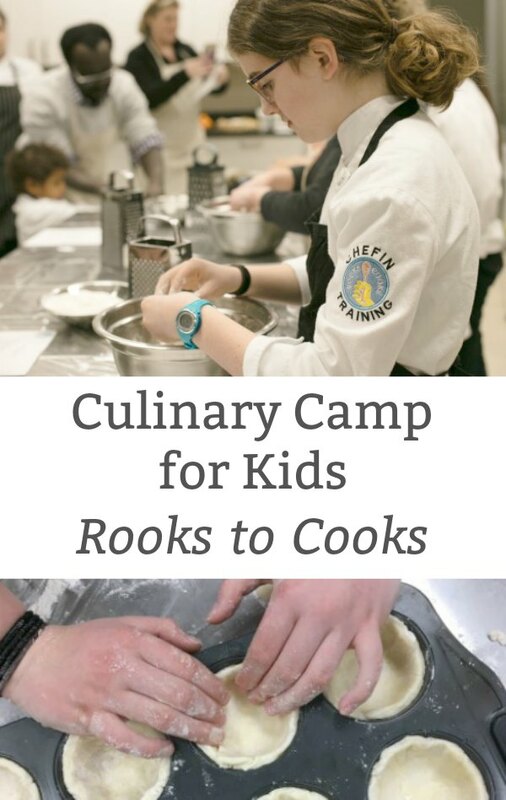 So, when the folks at Rooks to Cooks reached out with an invitation to see what their summer camps for kids are all about, I was excited check it out. My youngest daughter and I headed to Rooks to Cooks lovely, newly renovated location at Yonge and Sheppard. After arriving at the fully equipped kitchen my daughter donned her “chef in training” coat, we wrapped on our aprons and got to work. 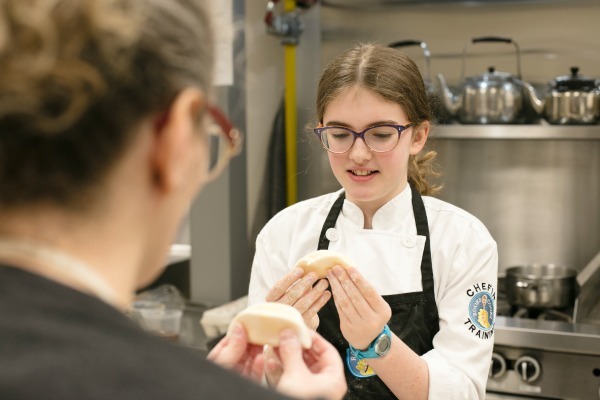 Under the guidance of Chef Shai Mandel we got a glimpse into what a typical day at a Rooks to Cooks culinary camp would look like. 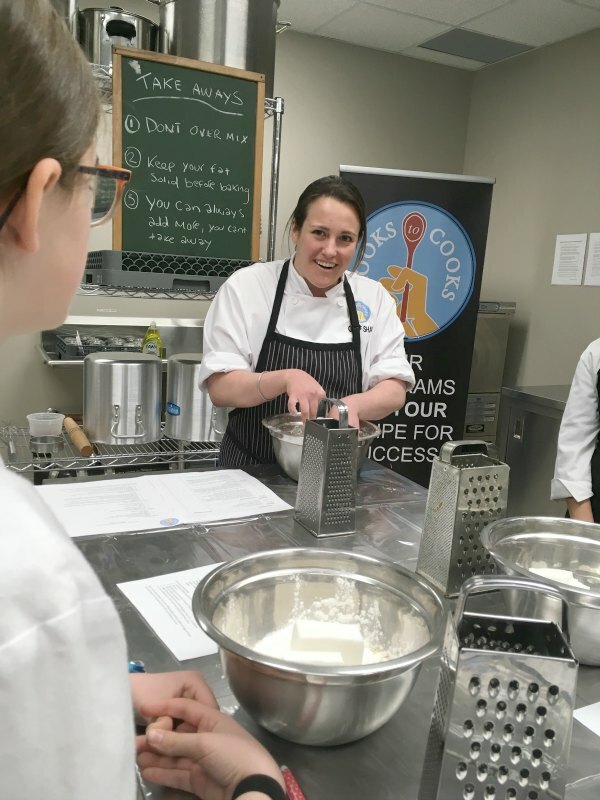 Chef Shai has combined her teaching background with her chef training to create a culinary program for kids that is interactive and educational. 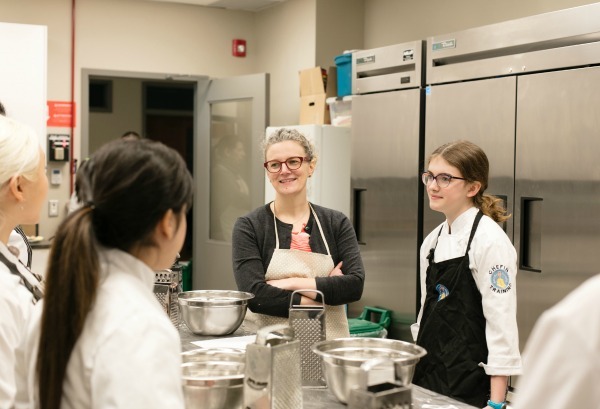 We learned quickly that the team at Rooks to Cooks is serious about getting the kids’ working and learning in the kitchen. Chef Shai emphasized the importance of building a child’s confidence in the kitchen. 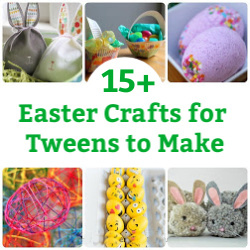 With confidence, kids are willing to try new things, learn and grow. 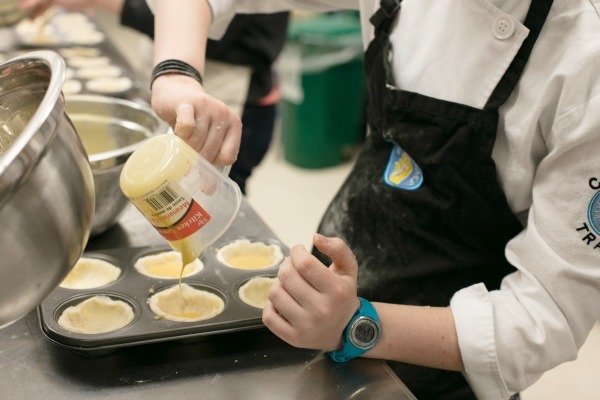 During our class, we made a signature dish of Chef Shai’s – butter tarts. 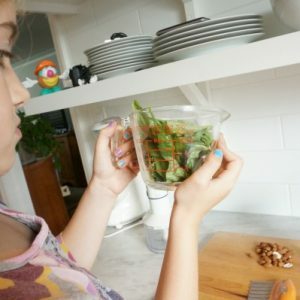 As my daughter worked her way through the recipe, the Rooks to Cooks team provided guidance and introduced my duaghter to new techniques. 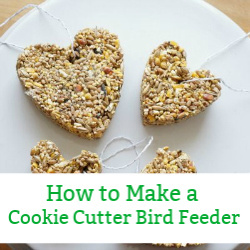 For instance, incorporating the shortening into the dough using a “pecking” technique…think of a chicken pecking at seeds on the ground. The instructor’s use of familiar and visual terms really helps the kids understand. From preparing the pastry dough to whisking the sweet filling the entire process was taken on by my daughter. 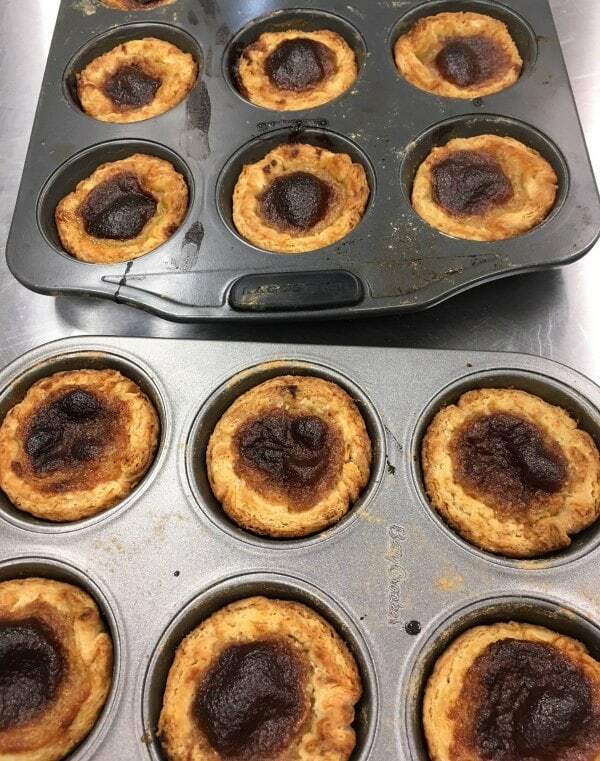 How proud was she when the butter tarts came out of the oven looking all bubbly and golden. Best of all, my kid went from an “I don’t really like butter tarts” kid to a “these butter tarts are delicious”. Yep, this is the power of having kids make their own food. 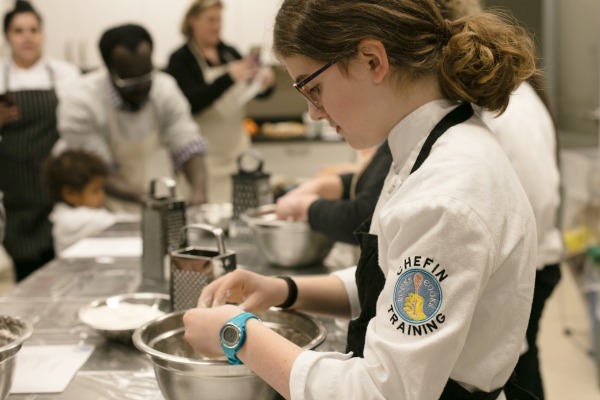 It’s amazing to watch a kid try new foods simply because they helped to make them. 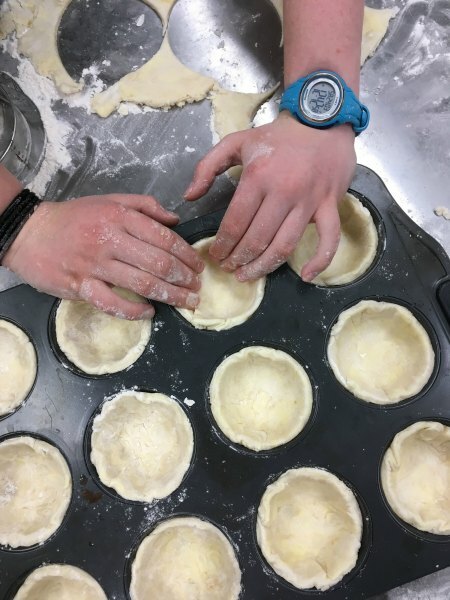 We had a blast at our baking class and the butter tarts were amazing. 1. 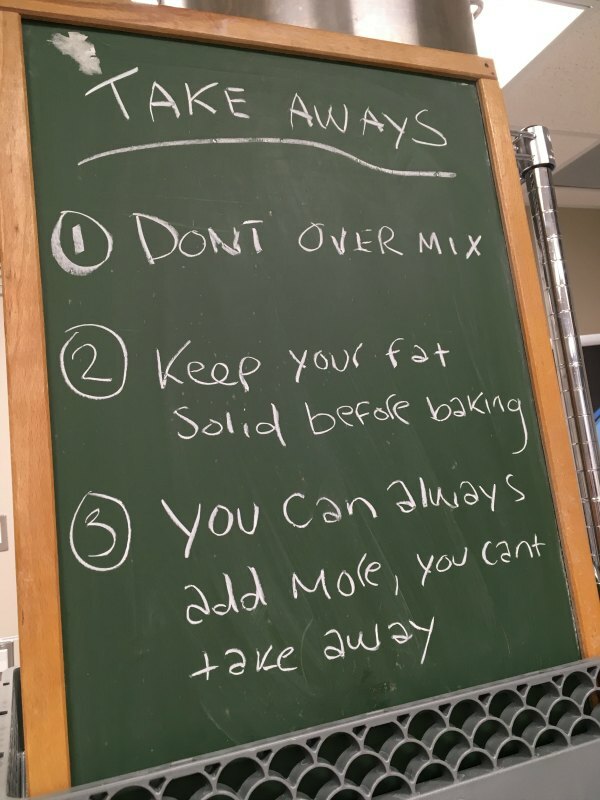 In a medium-sized bowl, combine the salt, sugar, flour, and shortening mix together. 2. Rub shortening into flour until reduced to pea sized crumbs. Once pea sized crumbs, grate cold butter into flour. Toss butter lightly using the salad tossing method. 3. Add cold water little bits at a time, mixing in between additions. Mix just enough to incorporate, do not over mix! 4. Transfer dough to floured table. Shape into a thick disc. Tightly cover with plastic wrap and allow to rest in the fridge for at least 30 minutes before rolling. 1. Combine all filling ingredients except pecans (if you chose to add). 3. Fill 2/3 with syrup mixture. 4. Bake on bottom shelf of oven at 425 Degrees F for 12 – 15 minutes. 5. Cool completely on a wire rack and remove tarts from pans. Note: If you want a firmer, less runny filling simply add an additional egg, increase the brown sugar to ¾ cup and decrease the corn syrup to ¼ cup. The staff were super supportive, friendly and knowledgable. Rooks to Cooks offers summer camp programs for children aged 4 years old and up. The Tots with Pots program is for kids 4-6 years old. This camp introduces your little one to basic kitchen skills. 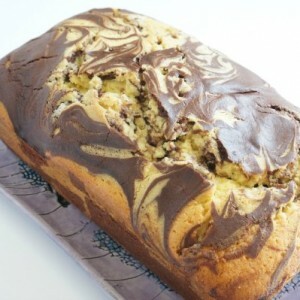 While the older kids (7+) can take a culinary trip around the world, test their master chef skills or become pro-bakers. Over the course of the week campers will learn a variety of new skill. Check out RookstoCooks.ca to explore the camp options that are available near you. Rooks to Cooks has 12 locations across the Greater Toronto Area. Disclaimer: Today’s post is sponsored by Rooks to Cooks, however as usual the opinions are my own.